So easy and delicious, the prefect first course. I found the recipe on the Food and Wine web site (foodandwine.com). The original recipe calls for honeydew melon, but those are hard to find in these parts. The famous melons of Cavaillon abound and work perfectly. Serves four. Light a grill. In a large bowl, combine lime zest and juice with the 1 tablesoon of olive oil Using a rubber spatula, gently fold in the diced melon and avocado. Season salsa with salt and pepper. Drizzle scallops with olive oil and season with salt and pepper. 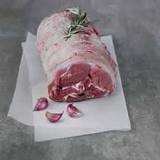 Grill over moderately high heat, turning once, until nicely charred and just cooked through, 3 to 4 minutes per side. 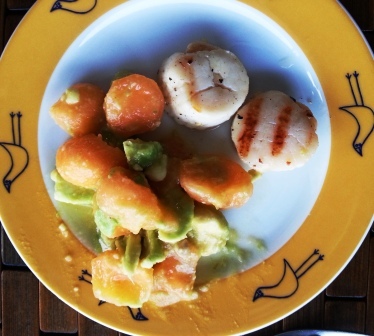 Transfer scallops to plates, spoon salsa alongside and serve. If you try this, let me know how it turned out. Maybe you even have a better idea to improve it — but trust me, it’s good.